Very few manufacturers in the model world ever achieved the levels of success and status, as did the Olivers, father and son. Their record in tethered car racing and team racing was second to none and the name is still held in such high regard that collectors avidly seek out anything related to the output of that company. However, this was all to be in the future, as the genesis of this marque had nothing whatsoever to do with model products. 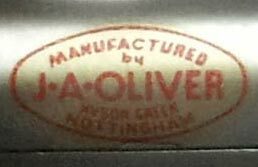 John Arthur Oliver (JAO) originally worked for Raleigh Cycles in Nottingham, before becoming self-employed repairing motorcycles and light cars during the period of the great economic depression. 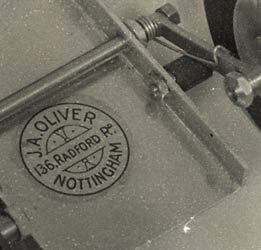 Through hard work and his ability to undertake almost any related task, the business under the title J A Oliver (Engineering) survived the turmoil, eventually ending up based at a cycle shop in Radford Road, Nottingham, an address to become known worldwide. The address of Radford Road is well known but less well known was another address of Hyson Green, the name for that area of Nottingham. A car was discovered in 2012 with a decal that stated manufactured by J A Oliver, Hyson Green. JAOs son, also John (JSO) confirmed that these were tube decals originally intended for cycles. The war years were spent producing parts for the nearby Royal Ordnance Factory. The move into producing model diesel aero engines came about almost by accident, but was providential, as the cycle business was struggling in the immediate post war period and the production machinery was largely idle. 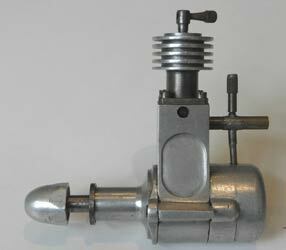 John S Oliver was serving in the RAF during that period and between him and his father developed an interest in small model engines, especially the compression ignition type, known henceforth erroneously as diesels, which were being developed on the continent. These rapidly replaced the more common spark ignition motors, especially in the smaller sizes. 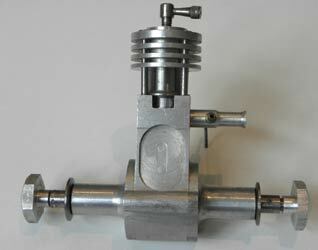 Around 1947 JA Oliver started producing parts for his first engine, the 2cc Battleaxe, based loosely on the Swiss Dyno. 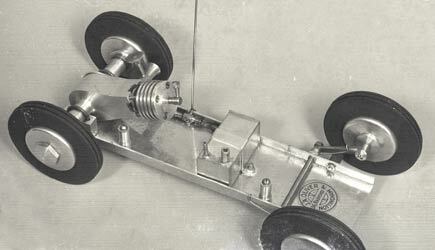 It has not been possible to establish what decided JAO to become involved with tethered cars, yet what is certain is that he quickly applied a principle that had been pioneered in cars such as Jim Cruickshanks’ Mercury 10 and added a second drive shaft to the back of the Battleaxe motor with the wheels attached directly to the shafts, so creating the ‘twinshaft’ motor that would make the company’s name. 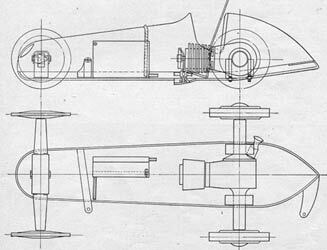 This layout negated the use of clutches, gearboxes and shafts that were the norm at that time. Added to a basic chassis, here was a cheap, simple to build, entry into tethered car racing. On leaving the RAF son John joined the company and was soon at work finishing off the second ‘Oliver’ car the ‘Challenge’. This employed a tubular alloy chassis, wire front suspension, a twinshaft direct drive Battleaxe motor enlarged to 2.5cc, with 1066 wheels and tyres attached to the drive shafts using tubular nuts. The first recorded appearance of these two cars on a track soon followed. In April 48 JAO was one of the founder members of the Nottingham Club, formed with George Brough as president, initially running on an indoor track before moving out to Bassingfield in 1951. At their first track day in June, JAO recorded 42.3mph with the No 2 car that had the 2.5cc motor, whilst the No 1 car with the original 2cc motor did 41mph. This signalled the start of the racing careers of the Olivers, although these two cars were quickly retired from the track. At the Hastings Trophy event held at Eaton Bray the Oliver’s entry was some 6mph slower than Jack Parker and his ED powered car. 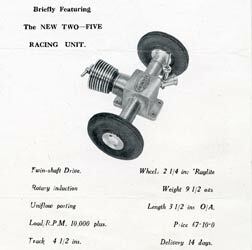 The Oliver motor was far from competitive against the EDs as yet, but that was soon to change and bring the name to the forefront of tethered car racing. At the Meteor Club meeting on October 31st. 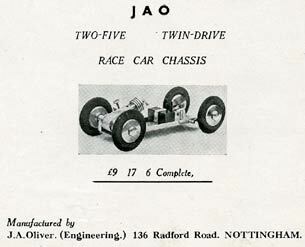 JAO set a new British 2.5cc record of 55.5mph using a ‘teardrop’ style car and 9-port development of the Battleaxe motor. His son finished 3rd at 41mph with the back-up car. Significantly, the first three 2.5cc cars were faster than any of the 5cc entrants. Jack Parker eventually became a customer of the Olivers, although his request for a ‘discount’ on a car was politely refused. Work was meanwhile continuing on developing the first commercial Oliver car. This would be somewhat different in design to those they were using for their racing, as both JA and JS were running the two teardrop style cars, one of which was called Newt, as well as a more conventional semi-scale type car that would become known as ‘Busy’. The new car was to be called the Two-Five and developed from the Challenge. 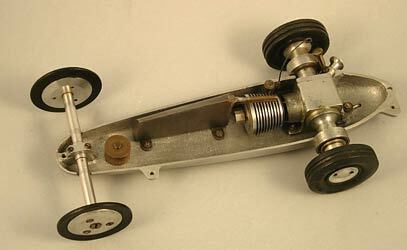 The chassis was now folded aluminium, still with piano wire torsion front suspension and the ‘nine port’ motor held onto the pan with U bolts round the shaft housings. Raylite solid tyres now replaced the 1066 items, but secured with very large hexagonal tube nuts. Olivers had established a commercial tie up with Raylite, another Nottingham company, with Raylite selling Oliver motors under their own name and Oliver using Raylite bonded tyres. Adverts first appeared from both these companies in the December issue of Model Car New in 1948. In April a further version of the original motor, now identified as the MKII and called the Jaguar twinshaft, was announced. The most obvious difference was the turned portion of the crankcase below the exhausts and the black anodised finish. The earlier version was still available at a slightly higher price of £7-17-6, but this now included a pair of wheels. The new motor was priced at £8-18-6. In a magazine test the Jaguar produced just over 0.2bhp at 8,700rpm although Oliver only claimed 0.16. The higher revs of the new motor required smaller tyres, which were advertised by Raylite in May of that year. JSO raced the ‘teardrop’ car in the MCA eliminators and National final, both held at the Derby track. He won each and every round of the 2.5cc Class, beating all other competitors by a huge margin in the finals. John accepted his prize from racing driver Bob Gerard and wife Joan. The birth of the motor that was to become the watchword for performance for the next decade or so was due in no small way to Gerry Buck from nearby Stoke on Trent. Gerry was a multiple record holder in the 10cc Class, but as a reaction to mumblings about his ‘superb facilities’ being responsible for his success entered the 2.5cc Class with the very simplest of cars. He bolted a standard 2.49cc Elfin aero engine to a basic chassis with a driving wheel attached where the prop would normally be, and covered it with an even more basic body. Within a couple of weeks this ‘Wee’ car was exceeding 60mph and went on to take British and Open 2.5cc records at every distance up to 1 mile and even set a record for 10 miles. JAO had accepted the invitation to travel to Sweden in the autumn as part of the British team, but both he and JSO were well aware of the leap in speed that Gerry Buck had made and realised that their Jaguar was not going to be competitive either against Gerry or the best the Swedes could muster. As a result, a new engine was designed and built in short order, literally over a very long weekend. The sideport layout was abandoned in favour of a disc valve, there being no time to consider a shaft valve, although finding room for the disc in the twinshaft layout did cause considerable head scratching. 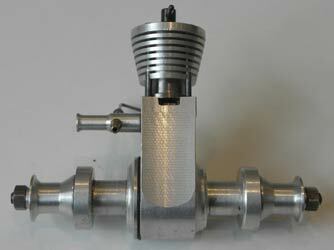 What they came up with was to use a cut out in the slave crank disc as the valve, running on the inner face of the separate shaft housing that also carried the venturi. According to an article by John S, the bore and stroke were a ‘matter of guesswork’ but even so, the motor was built in little over three days, and the only component it shared with the Jaguar was the compression screw. There was no time to build a chassis, so ‘Busy’ was dug out and the new motor installed. A quick and ‘iffy’ visit was made to the Derby track to see if the motor worked before JAO, Harry Howlett and the three cars were packed for the trip. At the Stockholm meeting ‘Busy’ duly won the 2.5cc class at over 64mph with Gerry Buck second nearly 10mph slower. At Orebro the roles were reversed as JA ignored his son’s entreaties before he left - ‘anything over 63mph DON’T FIDDLE’, and was 2mph slower. 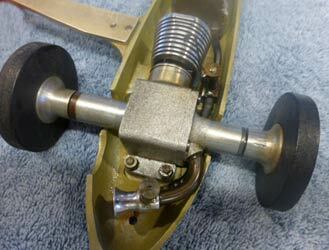 Gerry meanwhile had twiddled his needle valve and compression screw, to almost match JAO’s speed from Stockholm. So impressed were the Swedish competitors with the Oliver engines that JAO was reputed to have come home with orders for nearly 50 motors. The speed with which the motor was made meant that it was still held into the chassis by U bolts round the shaft housings, so the motor was redesigned with a cast crankcase that had a flat plate underneath to allow the motor to be bolted straight into a chassis so establishing the iconic design. This new motor became the RV, although it is understood that only around seven were produced. Not long after their return, from Sweden, fellow team member, Alex Snelling from Edmonton, requested that a ball raced version to be built for him, which became the RVB. 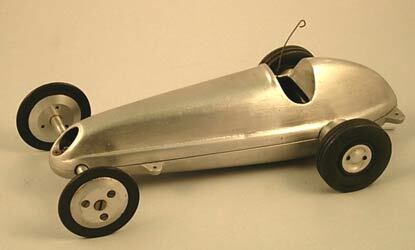 ‘Busy’ formed the basis of the first Oliver car made completely from castings. This was the second to be called a Two-Five. At the Meteor Club open day in Staffordshire the prizes were being presented by the West Ham and England speedway rider Harold Stevenson known to his fans as ‘Tiger’ and then running speedway nearby at Hanley. It was his suggestion to John Oliver that the, as yet unnamed, motor should be called the ‘Tiger’ and in doing so created a brand known worldwide to this day. The newly named ‘Tiger’ RV was for sale at £7-10-0 and by December the RVB ball bearing version at £8-18-6. 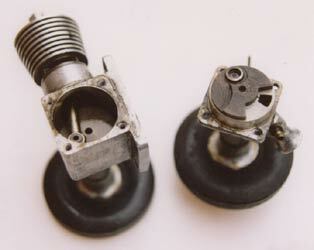 Taking the lead from Gerry Buck, a single ended BR model was also available at £6-15-0. 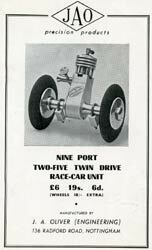 The Tiger Two-Five car kit was available at £10-9-6. In April 1950 the company advertised ready built and tested Tiger cars at £14-18-0. Harry Howlett was an integral part of the Oliver operation, being a close friend and enthusiast, but more importantly produced all the castings for Olivers. Having travelled to Sweden with JA, he purchased ‘Busy’ and used that as a basis for a more scale like car, resulting in September in the delightful Alfa Romeo 158. Castings were £1-5-0 as against the Tiger at 15/-. A new innovation was the ‘Tiger Day’ held at the club track in August 1950 with prizes for the fastest Oliver powered car and the best Oliver/Howlett car. This acknowledged the scale aspect of these cars and by using speed bonuses recognise attention to scale and detail. 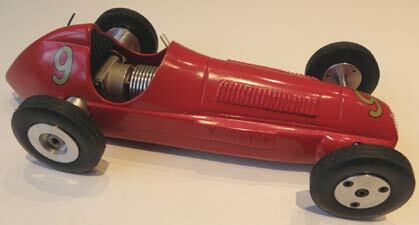 A further addition to the range of scale bodies was a Ferrari and it is believed that plans were in place for a BRM as well, although this does not appear to have made it into production. To give customers a range of options, all the cars could be supplied as raw castings, machined or completely finished and ready to run.